Post-apocalyptic whimsy is perhaps a bit of an underused genre in game storytelling. From your early few days in the sleepy town of Portia you’d be hard pressed to tell that anything bad had ever happened. It’s no Fallout, but that’s the idea. My Time At Portia has built itself up from a Steam Early Access title to become a fully fledged town sim with beautiful anime inspired graphics and a living, breathing game world. Publisher Team 17 have thankfully seen the opportunity to take Pathea Games under their wing to allow them to create their vision. The game starts with your character inheriting your father’s old workshop after he goes away on some mysterious adventure. A welcoming town representative shows you to your workshop and leaves you to get acquainted with the place. On entering, you realise that you’ve already got work to do; the floorboards need fixing and you’ll need to go out and find some wood to repair them before you can get any sleep. Some welcome that is, but it’s a great way to get you used to the process of gathering items and using them. This same Workshop acts as your hub, allowing you to make anything in your blueprint book using a set of tools (which you’ll need to build before you can start anything else) in the garden area. It also allows you to start planting items, though this can be expanded as you buy more land. Naturally, not everything is made of wood and it’s not long before the town’s people start to commission you to make other more complicated items. Some of the items require chasing after animals, others require mining. There are also rarer materials found in the caves dotted around the edges of the town, though these also contain monsters that need to be fought. Being a more laid back game, these battles aren’t overly complicated, though, and use a simple control scheme for fighting. Better weapons and tools can, of course, make things a lot easier. It’s worth noting that this game looks fantastic. The art style is somewhere between Breath of the Wild and a younger kids Saturday morning cartoon, though don’t let that put you off, it works very well in this style of game and it’s a joy to go and find new areas. The people you meet all have their own personalities and are voice acted as well, quite impressive for a game this size. The world is well built and you feel as if you are part of something living. Having played since Early Access, I’m surprised the cost of everything is still so high, particularly if you’re wanting to upgrade your tiny workshop. Parts and materials can take a serious amount of work to afford. It is, of course, possible to afford everything through hard work and patience, but it would be nice to fast track this just a little. This is balanced out, though, with seasonal events, new parts of the world that open up when you get further into the game and some great dungeon crawling adventures which progressively get more difficult as you level up. The townsfolk also feel as if they’re living their own lives and you can join in with some of their games when evening rolls around, passing a bit of time when your work is done before the next day. The main task, though, is to progress the ongoing story, where you gradually learn some of the secrets that Portia holds and, at the same time, learn a little more about your father. 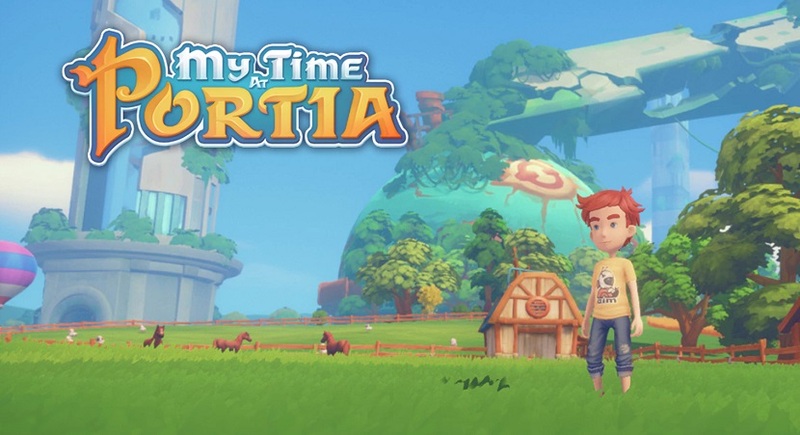 With so much to do and a gentle learning curve, plus the wonderfully imagined world, My Time At Portia is well worth picking up for those who love slower paced life sims with elements of adventuring.